If you’ve read my posts before, it isn’t a secret that I love this amazing company in California. Food Forward is not only full of the coolest people, but it does incredible things in the community for people in need. If you have fruit trees, they come collect the produce and then pass it along to those that need it most. They also pick up unsold produce from wholesale and farmers markets for the same purpose. Truly, they are magical, wonderful people. Each year, the ask me to help with their Spring Melt graphics. 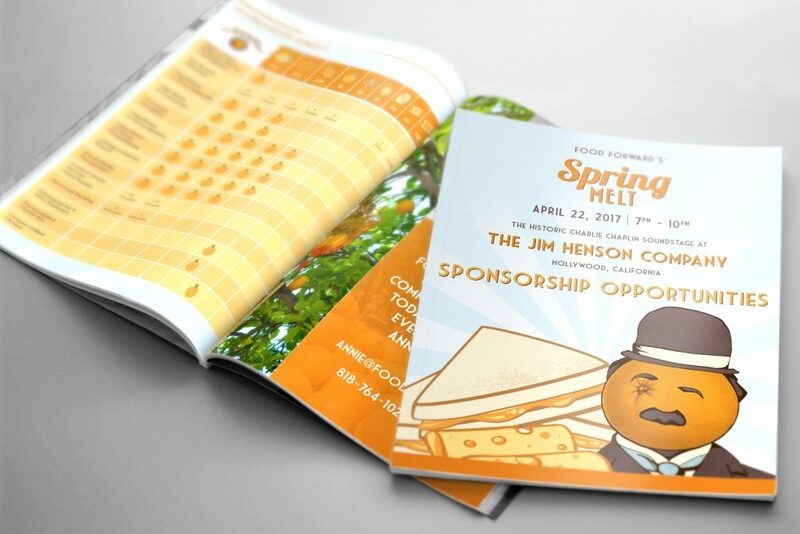 This year, I was excited to also have the opportunity to design the Sponsorship Opportunity Booklet. They hosted their fundraising event this year at The Jim Henson Studios. I decided to use the location to inspire the design of the Poster and Booklet. The Food Forward logo uses an orange and I used their orange as the face of Charlie Chaplin. 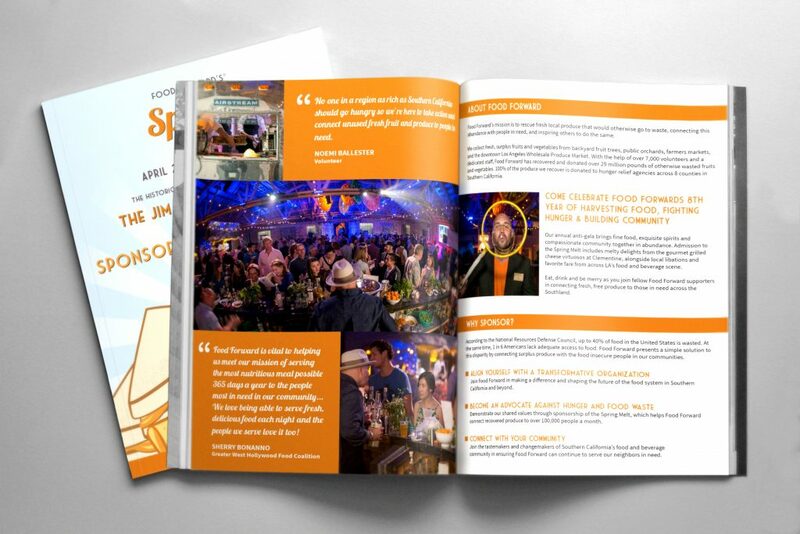 In addition, one of the features of the event is grilled cheese sandwiches, so we have utilized those on the cover as well. This project was also fun for me because I was able to design custom icons for each level of sponsorship. They had a successful Spring Melt this year, and as usual, I was happy to be a part of the process. I love this booklet and they had wonderful things to say of it as well. 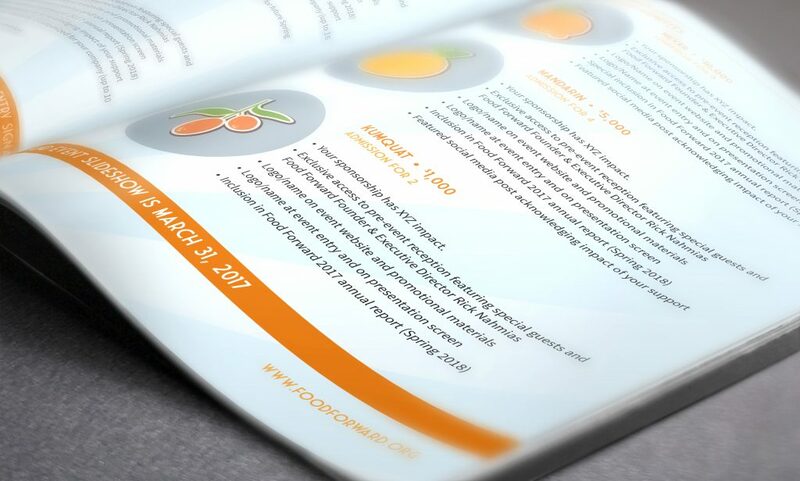 If you live in California, please check out Food Forward and get involved!